Confessions of a China Addict | Jordan Ink. Instead, I woke early to hydrofoil across the rocky, sun-soaked Pearl River Delta, back to the English-language United International College in Zhuhai. In a sauna of a classroom, before 20 (mostly) wide-eyed journalism undergrads, I sweat through three hours of my Parachute in! The Adventurer’s Guide to Foreign Reporting lecture: how I broke into freelancing 17 years ago, and how I’ve done it ever since. All this, for free. For a friend. For the students … Ah, who am I kidding? I did it for me. As I returned home Friday night, thoroughly wiped, I thought to myself: “You may have an addiction to China.” Or, more specifically, an addiction to teaching Chinese journalism students. The weekend didn’t cure me. On Monday morning, I volunteered to rise at another ungodly hour and represent our Master’s program in International Journalism at the graduation of last year’s students. I’d trained them twice: for six weeks in Hong Kong, then one week in Prague. On stage, I enjoyed a bird’s-eye view as dozens of beaming young Chinese heard their names called and – before family and friends – marched across to receive the hearty handshake of a pair of HKBU dons. I can’t deny it: China and her young Chinese have cast a spell on me. This country matters. Economically, diplomatically, militarily. The world’s emerging superpower is so endlessly fascinating, I’m dizzy with all that I want to write about it. Then there’s the teaching. 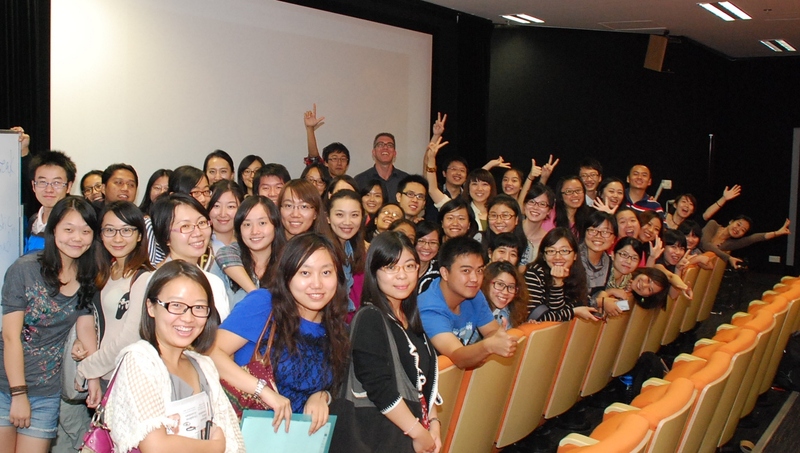 I now hear myself utter over and over again, to anyone who’ll listen: “China matters – which means my Chinese journalism students matter, too.” The apple of my eye today is HKBU’s current crop of students. From the very first moment I met them I placed a burden of responsibility on their shoulders: China needs you. The world needs you. Some think I’m joking. I’m not. By producing their own journalism blogs — in English, which is their second, third, or even their fourth language — they unveil a new breed of young Chinese: the ones most like us. English-speaking, Western-influenced, well-traveled and, in our Information Age, Web-sophisticated. With the right software, they hurdle the “Great Firewall” of Beijing’s censorship. They mind their step, though: dozens of journalists and bloggers rot behind bars. In the future, as the old guard dies off and China seizes its superpower status, the world will need Chinese partners with whom to dialogue, to nurture mutual understanding of positions and policies. They’ll want to find this generation of Chinese journalism graduates, their feet planted firmly in both worlds – largely because of their ten months in Hong Kong. The ex-British colony is not only the lone beacon for freedom of expression in China, but a haven for mainlander critics who escape the pressure. 1) Help mould young journalists who embrace the universal (not Western) journalistic values that society needs watchdogs to hold people – especially leaders – accountable for words and deeds. 2) Help them get a job. With Chinese journalism schools churning out thousands of graduates – I was told in Shanghai that the city itself has 15 such university programs. Their blog will separate them from the pack, as a platform to show, not tell, editors and producers what they can do. 3) Help pave that bridge between China and the Anglophone world. Teach them to write the way I write as a foreign correspondent. For any reader who discovers their blog, open a window onto China, bring it to life, humanize the place with vivid story-telling. Make it accessible to all. After two months, their blogs reveal a compassionate curiosity for people very different from them. In their first reporting assignment, most students opted for working-class stiffs at the bottom of Hong Kong society, especially the elderly still toiling because the pension isn’t enough. Their most recent reporting, on any minority or disadvantaged community, ranged from ethnic-minority grunts like Filipina maids and Indian construction workers, to the tiny Zoroastrian community, and the travails of autistic children, still-closeted lesbians, street-sleepers, neglected refugees, the jobless blind, and many others. After editing two posts from each student in the program, nobody knows their reporting like I know their reporting. The good, the bad, the ugly. Like when I rant for half-an-hour in each tutorial that they must proofread, then see some of the same amateurish sloppiness reappear next time around. Or the often-exuberant writing style, where they can’t help but insert themselves in a story and root for the underdog. And finally, the occasionally campiness of their “About Me” pages. I’ve heard the Just-a-girl-from-the-mainland narrative so many times, I could fabricate an online personality. *The Beijinger who after our very first tutorial confided that he “struggles” with the question of whether to return to a China laced with landmines of censorship and imprisonment – or stay put in Hong Kong. *The young woman who somehow finds the time to shoot B-roll and interview her classmates and me for a documentary she wants to make about their collective future. *The young fellow who last month expressed genuine concern for my health after a run of marathon tutorials – only to keep me an extra hour and pick my brain because he wants to freelance like me. At such a critical time in Chinese history – and in my students’ lives – can you blame me if I swoon? Yet there’s one final reason why these Chinese matter: After they graduate, how they fare in the mainland’s restrictive media is a canary in the coalmine for what sort of superpower China has become.